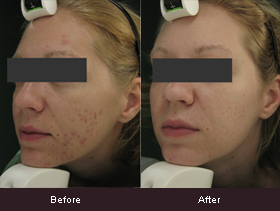 Photodynamic Therapy is revolutionizing the treatment of acne and skin rejuvenation. Acne or Skin Rejuvenation PDT treatments using Levulan involve the application of a photosensitizing agent which is then activated with light. This therapy results in significant improvement in moderate to severe acne, as well as dramatic improvement in wrinkles, pore size, skin texture and pigmentation. Generally a minimum of 3 treatments are recommended for optimum improvement.